So, it’s time to step up your wine storage game. Perhaps you already have a wine rack that is always loaded to the brim. Or, you’re tired of storing several bottles of wine in your refrigerator, taking up valuable space. Or, do you find yourself always trying to stick a bottle into a single wine chiller to get the wine cold at the last minute? If you don’t have the opportunity to build an entire wine cellar in your home, or if space is at a premium, a small wine cooler might be your stepping stone. 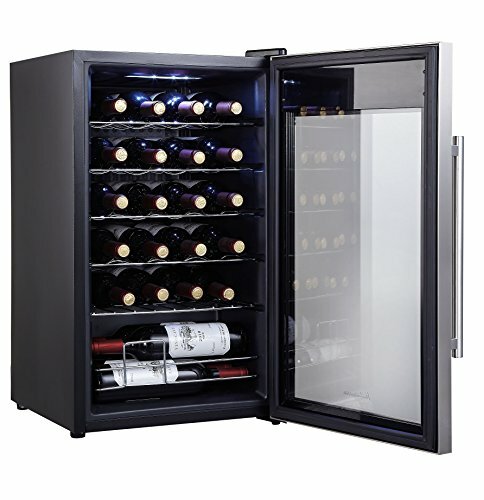 Looking For The Top Small Wine Cooler Fridge? Which is the Best Wine Refrigerator Option – Single or Dual Zone? This post is a mega buying guide for the best small wine fridge or small wine cooler you can buy. We include a few mini wine fridge options, that hold less than 12 bottles of wine. As well as some options that are a little larger, and a little more advanced, and could be considered a wine fridge cabinet. 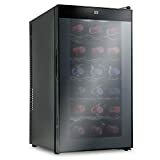 We provide individual wine cooler refrigerator options as well as a serious of wine refrigerator reviews. These wine cooler reviews include some of the top brands for wine fridges. I also cover some of the wine fridge basics. This includes a run through of wine refrigerators terminology, i.e. what is dual zone and single zone? What is a built-in cabinet wine cooler? What is a countertop wine cooler? I hope with this wine advice you can pick the best wine refrigerator for your home (or for a wine gift). If you have a particular question, please use the table of contents above to help answer your question. If I don’t cover it in this blog post, ask a comment below and I will try to get back to you shortly. 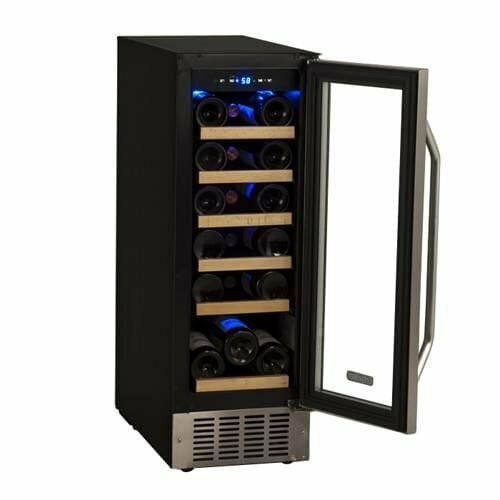 Included in this post is a series of wine fridge reviews to help you find the best wine cooler and wine refrigerators that fit your needs and your budget. Most of the wine refrigerator reviews are for wine coolers from Amazon. There’s a reason for this. I love the ease of purchasing on Amazon because you get really fast delivery (if you are a Prime member) and free returns. And, yes, it’s possible to get even larger wine refrigerators shipped to your for free or with easy, super-speedy delivery. 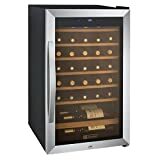 Amazon offers a wide selection of the best wine fridges and each offers loads of wine cooler reviews to help you choose. It’s not necessary to have a wine room or expensive wine cellar in your home (unless you want to). By choosing the right wine refrigerator, it’s possible to store both red and white wine, at the perfect temperature, making it always ready to drink. Or, if you travel for wine, you will have the perfect spot to store all of your wine souvenirs. We want to make purchasing your first (or next) wine refrigerator as pain-free as possible. Most important, purchasing one of the best small wine coolers should be fun and exciting, like it was for us when we bought our first wine refrigerator. Here are our recommendations for the best wine coolers that are on the smaller size. We identify a small wine chiller size as under 36 bottles. There is one that is 38 bottles, but it’s such a great wine bottle chiller I had to include it! Sure, it’s not a “little” wine fridge, but to us, anything under 75 bottles is a “small” wine cooler cabinet. We also offer our wine cooler reviews scale, rating each wine cooler on a scale of 1-5. This rating is based on our research of each wine cooler and their specs. We offer individual wine fridge reviews later in this buying guide, but if you want to get right down to it, this table includes our recommendations for some of the best wine coolers. Not ready to take the leap to a wine fridge? Check out our review of top wine racks. When choosing a wine cooler, it’s important to think about the type of wine refrigerator you want to purchase. There are single zone cooling refrigerators, dual zone cooling refrigerators, and built in wine coolers. There are horizontal wine fridges and countertop wine fridges. And, there are some other wine storage refrigerator terms that you should be familiar with when shopping for the best wine chiller options out there. A wine refrigerator with only one cooling temperature is considered a single zone wine cooler. There is one temperature control. And the wine is all kept at that same temperature. This is a perfect small wine cooler fridge for first-time purchasers. Or, it works for wine drinkers that only tend to drink red wine or white wine. In other words, it could work as a great red wine fridge or a white wine fridge. But, it is possible to keep both red and white wine in a single zone, it just means your red wine would be kept a little chilled as well. This is not a bad thing for long-term wine storage. But if you don’t generally refrigerate red wine to drink, you would want to remove the red from the wine bottle cooler a little before serving, to get it to room temperature. Dual zone wine refrigerators have two sections to them, generally with one section kept slightly cooler than the other. This is a good wine fridge for people who store both red and white wine. It’s possible to keep the white wine cooler than the red by adjusting the wine storage temperature. And, just because it is a dual zone, it doesn’t mean you are limited to larger wine storage options. It’s possible to have a small wine fridge that is still dual zone, but they tend to be a little more expensive than a single zone wine fridge. There are pros and cons to both single and dual zone wine refrigerators. But, to break it down to the simplest terms, are you a wine drinker or a wine collector? If you are a wine drinker, a single zone wine cooler is probably sufficient and can be a good value. You will most likely only chill white wine or sparkling wine anyway. But, if you are a wine collector, and you have both red and white wines that you want to lay down, to store, for months or even years, then a dual zone wine fridge might be worth the investment. More expensive red wines are happiest in a controlled temperature environment, one that doesn’t deviate much between the highs and the lows. That’s what makes a dual zone wine fridge a great option for a budding wine connoisseur. Is it worth it to spend a few hundred dollars more on a quality wine cooler in order to make the most of your wine investments? This is the best way to control the temperature to approximate a more professional wine cellar temperature. A built in wine cooler fridge is one that slides into your kitchen cabinet. It’s often best to purchase an under counter wine fridge when remodeling a kitchen, but it’s not necessary. You can also buy and install a wine refrigerator cabinet into an already finished kitchen. The under counter wine refrigerators have special ventilation that allows them to be installed within a cabinet. Although built in wine refrigerators can be super cool (sorry for the pun), they tend to be more expensive because of the ventilation needed. It’s also important to only buy a built in wine cooler that specifically says it is built in. It’s not a good idea to take any old wine refrigerator and install it as a cabinet wine cooler. It must specifically be a built in wine refrigerator. And built in wine coolers can also be a wine and beverage fridge, allowing options to store more than just wine. The opposite of a built-in wine fridge is one that is free standing. These wine coolers can include either single zone or dual zone wine refrigerators. The benefit is that they do not need to be installed, and can be placed anywhere in your home that has space and an electric outlet. And, a free-standing home wine cooler doesn’t necessarily mean big. There are different wine cooler dimensions and a slim wine fridge or a tall wine fridge might be the best small wine fridge for you. Most small wine refrigerators are made to sit directly on the floor or are an under counter wine cooler. But, it is possible to purchase a wine and beverage cooler that actually sits on top of a counter. Generally, a countertop wine cooler is smaller, maybe 6 bottles or so, although larger countertop wine coolers do exist. They would most likely be a single zone countertop wine fridge. And, they are a great idea for someone who wants to keep wine cool, more than store wine for the long haul. It’s also possible to put counter top wine coolers on a wine fridge stand, or really any counter top or furniture with sufficient space. Size: One of the most important considerations when purchasing small wine coolers is the size. If you have a lot of wine bottles to store, then choose a larger option. But, obviously, space is generally a concern. Just remember, in the future your collection may grow. Is it worth it to make a bigger investment today? And, be sure to measure the space where you plan to store your wine beverage cooler before purchasing and compare it to the small wine fridge dimensions. Because the best mini wine fridge is one that fits in your home! Appearance: Obviously your number one goal is to chill wine, but you also might want to consider how the wine cooler will blend with your kitchen or other furnishings. Do you want something that is black? Or a stainless steel wine cooler, or even wood to match your counters. Versatility: Do you want a wine cooler that is only made for wine or a wine and beverage cooler, that can also be used for soda or beer as well? It’s becoming a lot more common to see options that offer a beer and wine refrigerator combo. Even small wine fridges can offer a good amount of options and be very versatile. Security: If you have small children or curious teenagers, perhaps choose a refrigerator with a safety lock. Looking for the perfect wine gift for the wine lover on your list? Check out our wine gift buying guide. Or, looking for a travel wine chiller? Check out our guide to the best wine carriers and wine luggage. There are many different wine cooler brands, including Danby, Vinotemp, and KingsBottle. But other, lesser-known wine fridge brands, may also offer great opportunities for a less expensive, entry-level small wine refrigerator or a mini wine cooler. Here are our wine refrigerator reviews, with a focus on small wine coolers, defined as less than 36 wine bottles. offers a slick, contemporary looking 12 bottle wine refrigerator, which is a good starter option. It is a single zone with thermoelectric cooling, ranging from 54-66 degrees. And, it’s pretty cool looking in all black, with sculpted chrome shelving. The Magic Chef wine refrigerator is fairly quiet and offers an electronic control panel with an LED display. Pricing starts at only $115, making it a good bang for your buck in terms of price to size ratio. This could be in the running for the best budget wine fridge for first-timers. They also offer this option for 6 bottles and 24 bottles too. Typical red and white bottles fit well, but some champagne bottles might be more difficult to fit in. See more Magic Chef Wine Cooler Reviews. Looking for a true Magic Chef mini wine fridge? Check out the 6 bottle Magic Chef wine refrigerator. Looking for something smaller? A tiny wine cooler might be the best compact wine fridge and can work well as a gift for wine lovers. 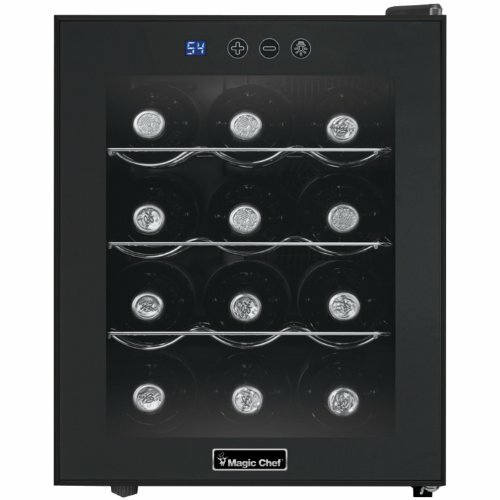 Check out this 6 bottle Magic Chef small wine chiller. This is also the smallest wine refrigerator size I would recommend. I love my wine, so for me, the best small wine fridges would start at 12 bottles. Another great wine refrigerator option is this Wine Enthusiast 12 bottle wine fridge. 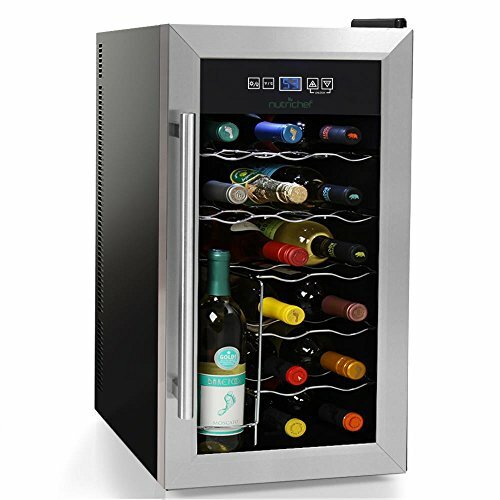 The Wine Enthusiast wine cooler is stainless steel, and more horizontal than the Magic Chef. It’s a cool looking countertop wine cooler option and includes sliding shelves for easy access. The shelf spacing in this Wine Enthusiast wine fridge allows storage for champagne bottles as well. This small wine fridge temperature range is from 50-66, making it a little cooler for white wines than the Magic Chef. And the wine Enthusiast mini fridge is a single zone cooling fridge. The temperature controls are on the outside. It’s not necessary to open the fridge to adjust the temperature. They also offer a black version, which still has the wooden shelves. See more Wine Enthusiast Refrigerator Reviews. Looking for something a little bigger than the Wine Enthusiast 12 bottle wine refrigerator? How about this “Silent” Wine Enthusiast 18 Bottle Wine Refrigerator? Ivation wine coolers are some of the best on the market, and have a remarkable reputation. 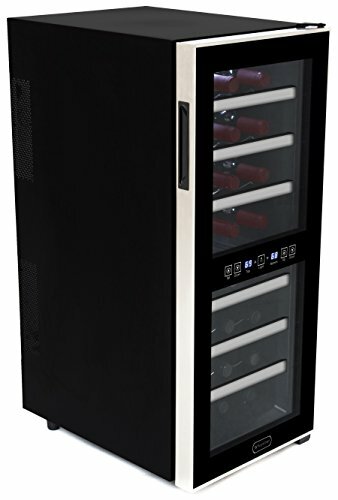 This 18 bottle Ivation wine fridge is a free-standing wine cooler that can adjust to chill both red or white wine. Although a single zone wine fridge, the doors are made of tempered smoke to protect against light and works to maintain constant humidity to help keep corks from drying out, acting almost like an Ivation wine cellar rather than just a fridge. The fridge also promises no vibration and quiet cooling. The shelves can be removed to allow for storage of larger bottles too. See more Ivation Wine Cooler Reviews. Looking for something smaller? Check out this Ivation 12 bottle wine cooler. The 18 Bottle Nutrichef Wine Cooler incorporates some features that didn’t exist in personal wine coolers in years past – room for standing bottles! This is perfect for champagne bottles, or taller bottles like Rieslings. What a great solution to maximize space. The Nutrichef wine fridge offers space for 14 horizontal bottles, and 4 standing bottles, although that could be only 3 standing bottles if space is used for large champagne bottles. Although still single zone, the Nutrichef wine cooler can be placed on a countertop or offers better ventilation to also be inserted within a wine cabinet in the kitchen. This slim wine cooler comes with thermoelectric cooling, adjustable temperature control, and LED lighting. It’s also ultra-quiet, so it can be used anywhere in the house. See more Nutrichef Wine Cooler Reviews. 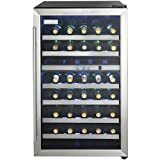 This 18 bottle EdgeStar Wine Fridge offers a great option for a single zone wine refrigerator that can be both a free-standing or a built-in small wine fridge. And it’s a narrow wine fridge, so it can pretty much fit anywhere. This small wine cooler is only 12 inches wide. The EdgeStar wine refrigerator has a nice, classic look to it, with a stainless steel reversible door. The reversible door is great because you can open it to the left or right, depending on where the wine fridge is placed. And, the wooden shelves give the wine fridge a very classic, more professional look. It’s frost free and includes a carbon filter. EdgeStar wine coolers are a good value for the quality. Check out the latest price for the Edgestar, one of the best small wine coolers brands and a more narrow wine cooler. See more EdgeStar Wine Cooler Reviews. This Whynter Dual Zone Wine Cooler holds 12 bottles in each of its two zones. 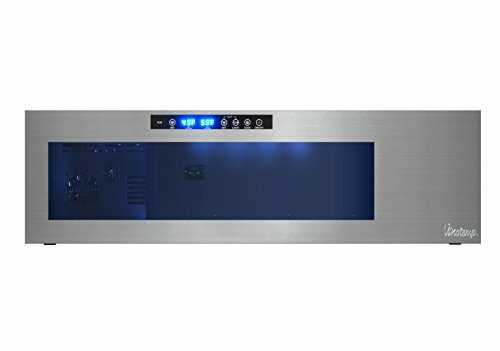 Because it is a dual zone wine fridge, you can adjust the temperature for each zone, but the lower zone offers the lower of the two temperatures. Similar to some of the other higher-end wine fridges this wine cooler offers vibration-free thermoelectric cooling. That said, Whynter suggests ensuring the air exhaust is not covered, making this better as a free-standing wine fridge and not a built-in wine cooler. See more Whynter Wine Cooler reviews. Looking for something bigger? Whynter wine refrigerator reviews show that they excel at elegant, larger wine refrigerators. Check out this 40 bottle Whynter wine cooler with French doors or this 33 bottle single zone Whynter wine fridge. Both are simply stunning to look at. This Kalamera 24 bottle single zone wine cooler works as good as it looks. It offers a wide range of temperatures, providing more flexibility, particularly for chilling white wine or sparkling wine. The Kalameera mini fridge also offers low vibration, which is important when storing valuable wine as vibration can affect longevity. The chrome shelves are also removable, meaning if you want to store a larger bottle for a period of time, there are no worries. See more Kalamera wine cooler reviews. Looking for something larger? The Kalamera company makes some high-quality wine fridges that are larger, and probably don’t fit as squarely into the small wine fridge category. Check out these other Kalamera wine fridge options, including a 46 bottle Kalamera dual zone wine fridge and a 66 bottle Kalamera wine cooler with lovely French doors. Okay, so this might not fit into the definition of “small” wine coolers under 36 bottles, but Danby Wine Coolers offers some top quality wine refrigerators. This one must squeeze into the list because it offers a great bang for the buck, and it not a large wine fridge. Danby has been making refrigerators and appliances for over 65 years, and has a specialty in offering some of the best wine coolers for sale on the market. But they are not known for producing a Danby mini wine fridge – this one is pretty much as small as they get. 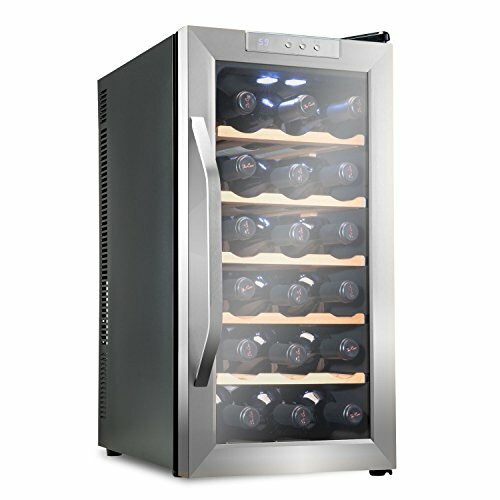 This 38 bottle Danby wine chiller is dual zone, with wine cooler temperature ranges from 39-64 degrees. The white interior light showcases the wine without the heat of an incandescent light bulb. And, the doors are not only reversible, but the tempered glass helps to protect the wine from sunlight. Finally, it looks pretty slick, with stainless steel trimmed shelves to match the stainless steel exterior. This Danby wine fridge is the perfect entry-level wine refrigerator for people who take their wine seriously. It’s like having a small wine cellar in your living room! Check out the latest prices for Danby, one of the best small wine cooler options, where “small” is 38 bottles! See more Danby Wine Cooler Reviews. Vinotemp is another brand that specializes in wine coolers and some of the best wine fridges. This 6-Bottle Open Vintotemp Wine Fridge is a great alternative to a basic 6 bottle wine cooler, with an added twist. This Vinotemp is an open wine cooler, which means you can store open bottles while keeping them cold. This was once only an option for bars, hotels, and restaurants. But, now you can store your open bottles at home the same way, in a horizontal wine fridge! It’s a way cool Vinotemp wine chiller. See more Vinotemp Wine Cooler Reviews. 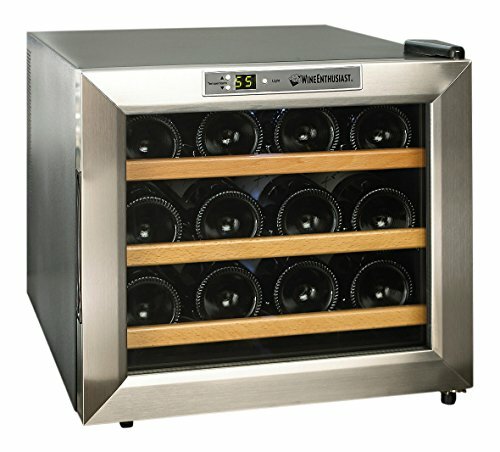 Looking for something a little bigger than this Vinotemp 6 bottle wine cooler? 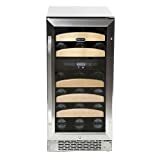 Check out this cool mirrored Vinotemp Wine Cooler 12 bottle wine fridge (that also comes in other sizes) or this Vinotemp Wine Cooler 28 bottle wine fridge (that is way retro looking). I felt as though I was “squeezing” in the Danby 38 bottle wine fridge under our “small wine cooler review.” But it seems our readers love wine as much as we do! 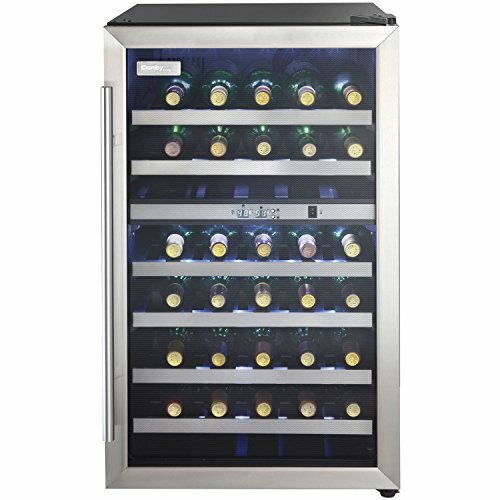 So far, the most frequently purchased wine cooler has been a 46 bottle wine fridge! It’s no surprise, really, because our readers probably like drinking wine as much as we do. So, if our readers like it, I figured I had to include it. And it has some top wine cellar reviews too. The Kalamera wine cooler is dual zone wine fridge and is quiet with reduced vibration. The reduced vibration is important because it doesn’t disturb the sediment as the bottle ages. Because it’s dual zone, it holds both red and white wine bottles and has space for larger champagne bottles too. And, it can be used as a free-standing wine fridge, or be installed as a built-in wine fridge, so this Kalamera kind of does it all! Thanks to our readers for pointing this one out! Thus far we have defined the best small wine fridge as a wine refrigerator. There are other ways to chill wine that don’t involve an investigation into wine fridge dimensions or a review of wine cooler reviews. There are some newer home wine cooler options that merely chill a single bottle of wine. When should you choose a wine chiller rather than one of the recommended wine fridges from above? I still think it’s worthwhile to choose among the best wine fridge options above if you are a wine collector, or drink a lot of wine (like we do). In the summer, we may go through two white wines a day. If you only drink a bottle of white wine on occasion, then the best wine cooler for you might be a wine chiller. So, what is a single wine chiller and how does it work? Sometimes, the wine chiller is placed in the freezer and then inserted into a bottle of wine when needed. In some cases, the wine is aerated through the wine chiller into another bottle or a wine decanter. Either way, there are a lot of options for the best single bottle wine chiller.